As the Rescue department gears up for bringing turtles south for release. I thought it would be interesting to show you some photos from the record smashing event and compare them to what it looks like in the hospital area today. Above, our hallways lined with banana boxes of turtles. The picture on the left shows when the animals are being triaged after arriving from the Massachusetts Audubon at Wellfleet Bay Wildlife Sanctuary. The picture on the right shows the turtles lined up getting ready for a transport to another facility for continuation of care. Today the hallways are clear of turtles. Life in the rehab area has resumed its normal operations. The above pictures give a rare peak at what it looks like when over 300 turtles are in the facility at one time. Normally (as seen here), we try to keep our turtle lanes to under six animals at any given time. 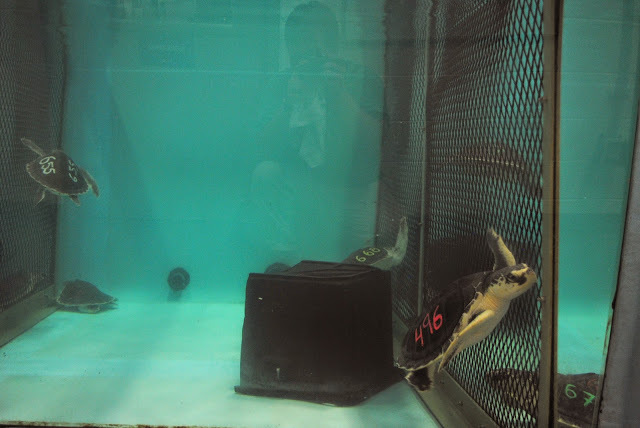 During the warming up process the turtles graduate through various phases of temperature controlled swimming. In the following pictures two of our patient overflow tanks are full of recovering turtles. These systems are still in use but after the upcoming release they will be empty again. Below: same systems as above. To the left is during the event. To the right is today. Within the next few months hopefully all of our turtles will be released. The tanks will be emptied, cleaned and scrubbed. As we anticipate the next batch of cold-stunned sea turtles that will be needing rescue and rehabilitation come the fall.